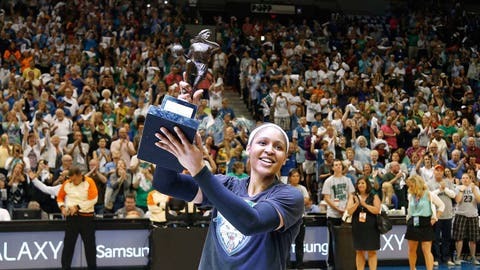 Lynx forward Maya Moore, the 2014 WNBA MVP, enters her fifth season having led Minnesota to titles two in the past four seasons. MINNEAPOLIS — When Lynx superstar Maya Moore said she wasn’t going anywhere, she meant it. After telling reporters earlier this week she planned to re-sign with Minnesota, the restricted free agent made good on it Thursday. As usual, specific terms of the multiyear contract weren’t disclosed. "I’m so excited to continue to compete for championships with the Lynx organization," Moore said in a release. "It’s been a privilege to work with some of the best teammates, coaches, staff, and ownership these past four years, and I’m looking forward to many more." The 2014 WNBA MVP enters her fifth WNBA season having led Minnesota to WNBA titles two of the past four seasons. Her 23.9 points per game were a franchise record, and she also averaged a career-best 8.1 rebounds, 3.4 assists and 34.7 minutes per game. Moore has been in Las Vegas training with the USA Basketball national team in preparation for next year’s Olympics and wasn’t able to sign the necessary paperwork until Thursday. She led Shanxi to a Women’s Chinese Basketball Association championship for the third year in a row earlier this offseason. Moore returned from China and took in her alma mater Connecticut’s third straight national championship win last month, then went to New York for the inaugural Jordan Classic high school all-American game. "We are thrilled that Maya will continue her career with the Minnesota Lynx," team executive vice president Roger Griffith said. "Maya has proven herself to be one of the best players in the WNBA after earning last season’s WNBA MVP honor and helping our franchise win two championships in her young career. Her continued success and leadership will be great for our franchise moving forward." The Lynx open training camp May 17. Their first regular-season game is June 5 at home against the Tulsa Shock.